Arguably Hong Kong’s most beautiful district, Sai Kung offers an escape from the stresses and strains of one of the world’s busiest cities. Our guide to Sai Kung showcases the absolute best in the neighbourhood. Nestled in the northeast of Hong Kong, Sai Kung, a former fishing village hidden amongst lush greenery, forms a stark contrast to the metropolis’s bustling city centre. Often referred to as the “backyard of Hong Kong,” it is known for being home to some of the city’s most challenging hiking trails and picturesque scenery. Look beyond the picture postcard views, however, and you’ll find an old town brimming with idyllic charm and a small community vibe, plus plenty of coffee shops, quality restaurants, and fun-filled destinations. Here are Hive Life’s top picks. A newcomer to this seaside neighbourhood, this quaint Melbourne-style coffee shop at Sai Kung Hoi Pong Square has proven itself a popular addition to the burgeoning local coffee scene. With stunning interiors, this laneway gem oozes cosiness and character. Serving up quality coffee and healthy breakfasts, this is a local favourite with good reason. Insider Tip: Be sure to bring a good camera for their Instagram-worthy dishes and designs. Just a minute’s walk from Sai Kung Bus Terminus, this café and bakery may look insignificant from the outside, but, given the delicious smell of freshly baked pastries wafting out its doors and the hungry folk regularly lining up outside, what it has on its shelves is clearly well worth the wait. Insider Tip: The early bird catches the worm! Treat yourself with one of their famous Portuguese egg tarts or a classic buttered pineapple bun fresh out of the oven. Tucked away at the far end of Sai Kung’s famed Seafood Street, Sing Kee is a relaxed restaurant where you can dine and soak in the sea views. Although its exterior is unassuming, this local joint was awarded a Michelin star in 2015 thanks to its scrumptious and creatively prepared dishes – think crispy chicken, deep-fried abalone and steamed scallops with vermicelli. Insider Tip: You’re very welcome to pick your own dinner from the fish tanks outside the restaurant! Not a huge fan of seafood? Make your way to this yellow pizza house just a seven-minute walk away from Sing Kee. Open since 1992, this neighbourhood mainstay has hosted thousands of hungry local diners, pizza connoisseurs, and tourists in its cosy space, serving up authentic Italian comfort food in all shapes and sizes. Their most popular fare? The New Orleans pizza which comes topped with chicken and blanketed in cheese, sour cream and sweet chilli sauce. Insider Tip: Every Wednesday, customers can enjoy a Buy-1-Get-1-Free deal for three types of steak. And, don’t miss out on their much-loved ‘2X Tuesday’ deal, where you can grab two large pizzas for HKD 195. Not for nothing has this humble Vietnamese restaurant seen the likes of Chow Yun Fat stop by for some noodles. Famous for its pho, this no-frills Vietnamese eatery overlooking buzzing King Man Street is a simply-decorated space that serves up great food for less than HKD 50. The real draw, however, is their Vietnamese soup, simmered for 10 to 12 hours to get its rich flavour. And don’t miss out on their excellent variety of comfort food including shrimp cakes, spring rolls, and garlic chicken wings. Insider Tip: Keep on the lookout for famous diners – both Chow Yun Fat and award-winning actor Sean Lau Ching-wan visit on occasion. Whether you’re looking for a beachside dining experience or a long, lazy lunch, Thai Dao should be on your list. Perched on the water’s edge of Sai Kung Sha Ha Beach, head to its outdoor terrace for a wide range of authentic Thai delicacies to be enjoyed over an unobstructed view of the sea. At night, when its outdoor canopy is strewn with fairy lights, this waterfront gem is also a win for a romantic dinner. Insider Tip: The highlights here are their deep fried crab, not to mention their much-loved Thai mango dessert with sticky rice and coconut milk. If you’re after an unpretentious pub that still has a bit of extra charm up its sleeve, Bacco is an ideal candidate. With a long history that dates back to 1985, Bacco celebrates a unique mix of tradition and modernity. Sharing the same space with the Michelin-rated Indian restaurant Jojo’s, it has been a prime location for a quality meal with laid-back drinks for locals for years. Insider Tip: If you’re down for some fiery football moments alongside pub grub and pints, head over to Bacco for their regular live coverage of sports games. With panoramic views of the Sai Kung sea as its backdrop, Momentai is the ideal spot to chill out with a drink after work. Just a stone’s throw away from the main pier, this bistro boasts plenty of beer and wine options, offering up a game of post-work pool, board games, pub quizzes, and plenty of music to keep you entertained. Insider Tip: Keep an eye on their calendar so you don’t miss out on their upcoming events, including waterfront yoga sessions, a pub quiz and gaming gatherings. Not so much a snooker person? Head to Tikitiki to try your luck at bowling. A funky, tropical-themed hangout, it features 10 bowling lanes, a bar, live music lounge, dining area and terrace, making it perfect for parties and big gatherings. Insider Tip: Want a free dinner? Reserve a table at Tikitiki any time from Monday to Thursday to get a chance of winning a scrumptious T-bone dinner. What’s not to love about a night at an open-air cinema or a detective game? At the Hive Sai Kung, a coworking and events space just a 4-minute walk away from the town centre, you’ll find an open-plan office space, café, decked courtyard, and a secret rooftop where you can work, gather and network with fellow Sai Kung residents. Insider Tip: Every Wednesday, The Hive Sai Kung welcomes everyone to come and enjoy their beautiful coffee lounge! So, bring your laptop and enjoy your first barista-style coffee for FREE. A little slice of France on the Hong Kong seas, Le Magasin stocks a selection of charcuterie, artisanal French cheeses and other French delicacies. A well-kept secret down a winding alleyway in Sai Kung Old Town, head here to stock up for an upcoming picnic or to buy a delicious bottle of wine for a party. Insider Tip: Feeling too lazy to travel all the way to Sai Kung Tai Street? Shop from the comfort of your home via their website! Located in the heart of Sai Kung Town Center, and recently voted The Best Fitness Class in Sai Kung by The Readers’ Choice Award 2018, The Studio is your one-stop fitness destination. Offering a wide range of fitness classes including Zumba, pilates, Taekwondo, and Hapkido training, The Studio caters to everyone from those who can only spare an hour to workout junkies. Insider Tip: Once a month, The Studio hosts a Yamuna Body Rolling workshop to help ease out your aches and massage those tight, overused muscles. Not sure if you can handle that while pregnant? You can also join their pre- and post-natal yoga sessions. If you’re in the mood to hit the water, the Blue Sky Sports Club is your go-to for some thrilling activities. 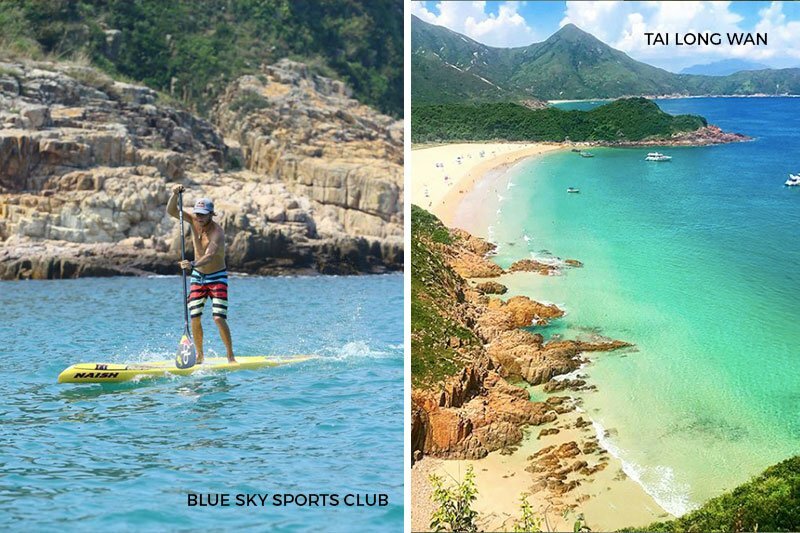 Established in 2001 by a group of sports professionals, the club offers more than just kayak rentals (HKD 150 per day). Conveniently located at the end of the Sai Kung waterfront promenade, it runs tours and classes from paddle boarding to dragon boating, all against the stunning backdrop of Sai Kung’s national parks. Insider Tip: If normal water activities don’t excite you, perhaps their transparent kayak tour will. With their 100% clear kayaks, immerse yourself in the world of wonder around and under you. It might take a little leg work to get to Tai Long Wan, but we guarantee it’ll be worth the sweat. Nestled along the east coast of the Sai Kung Peninsula, this secluded spot is Hong Kong’s closest tropical beach escape, boasting crystal clear water and soft white sand. Just a hop and a skip away is a stunning waterfall along Sheung Luk Stream with a stunning 40-foot cliff drop. Fancy more than just a day in the great outdoors? You can camp out here! There is nothing more relaxing than falling asleep to the sound of waves crashing onto the beach. Insider Tip: Take a taxi straight from Sai Kung Bus Terminal to the Sai Wan Pavilion if you’re down for a short 30-minute hike, or hop on a boat directly from the Sai Kung Pier.